A large, windowed area next to the main entrance at 113 Lincoln Avenue, the jewel box has featured old crates, a Christmas tree and, now, a lithographic press that did its heaviest duty in 19th-century Florence. We asked Tom Leech, curator of the Palace Press, to fill us in on its background. Here’s what we learned. Likely made by the French manufacturer Voirin, the press is similar to one shown in an 1893 poster by Henri Toulouse-Lautrec. It was used for many years in what was described as “an ancient commercial printing shop” in Florence, Italy, and was featured in the 1965 International Antique Exhibition in Florence as an example of 19th-century printing. In 1971, it came to the United States, where it stood in unused storage until its donation to the museum – then the Palace of the Governors – in 1989. 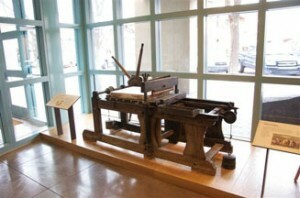 The Palace Press had been established in 1972 to preserve the history of the state’s printing traditions. Newspapers, books, wanted posters, dance-hall fliers. You know, the kinds of things that people at one time actually held in their hands and read (and then, perhaps, washed the ensuing ink off their hands). Its emergence into the jewel box marks the first time it’s been on display in this nation. In the 19th century, images created via lithographic printing were the latest technology – the Apple Tablets of their time. Invented in 1796, the process soared in popularity and importance in the 19th and 20th centuries. Here’s how it works: You make an image on a polished limestone with grease crayons, pens or pencils. Since grease and water repel each other, you then wipe the stone with a damp sponge, then roll ink on top of it. Where the image was drawn, the water didn’t stick, but the ink did. You could then transfer the inky image to a piece of paper using a press. Lithography also carried the world to the viewer. Easterners of the 1800s era loved hearing about Southwestern travel and exploration. An account of the 1849 Navajo Expedition included illustrations by artist Richard Kern. Marvels such as Inscription Rock (at today’s El Morro National Monument) were depicted in print for the first time. 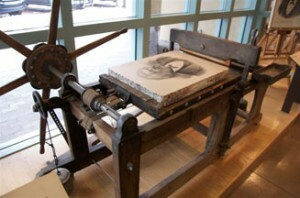 On the press in the exhibit is a stone depicting abolitionist Frederick Douglass (1818-1895). The image was created by Chicago lithographers Kurz & Allison a year after Douglass’ death. The print was commissioned for this exhibit and printed from the original stone by the Landfall Press of Santa Fe. Kurz and Allison prided themselves on “originating and placing on the market artistic and fancy prints of the most elaborate workmanship.” Portraits of influential Americans were popular, but most of their prints were of historical scenes, especially Civil War battles featuring dramatic (and at times contrived) action. Another of the company’s specialties was printing religious images for “ethnic” markets. Some of those prints can be found in New Mexican votive tinwork. Come on by and check it out. You can even come in and see the exhibit without paying the entrance fee. We’re pretty sure that, once you do, you’ll want to see more – including the Palace Press, just off the courtyard. Besides serving as an exhibit area for other antique presses (has that term become redundant yet? ), the Palace Press is a working print shop, still pumping out those “other” hand-held reading devices so many of us love.